Today I want to introduce you to a new-to-me subscription service! 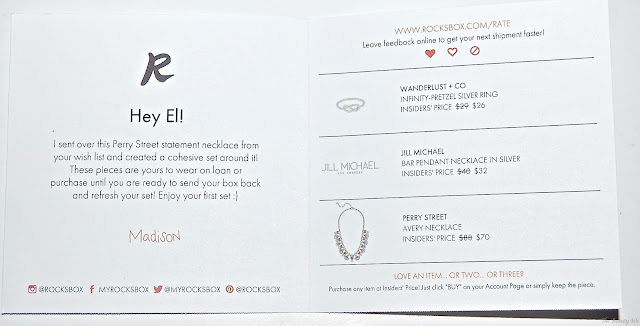 Rocksbox is a monthly jewelry rental subscription service. Think Netflix, but with jewelry instead of DVDs. Quick summary...you receive 3 jewelry items, you keep them for as long as you like, when you send them back, a new set of 3 pieces is sent out to you. Want a free box? Go to the Rocksbox site and use code thebeautyislexoxo! 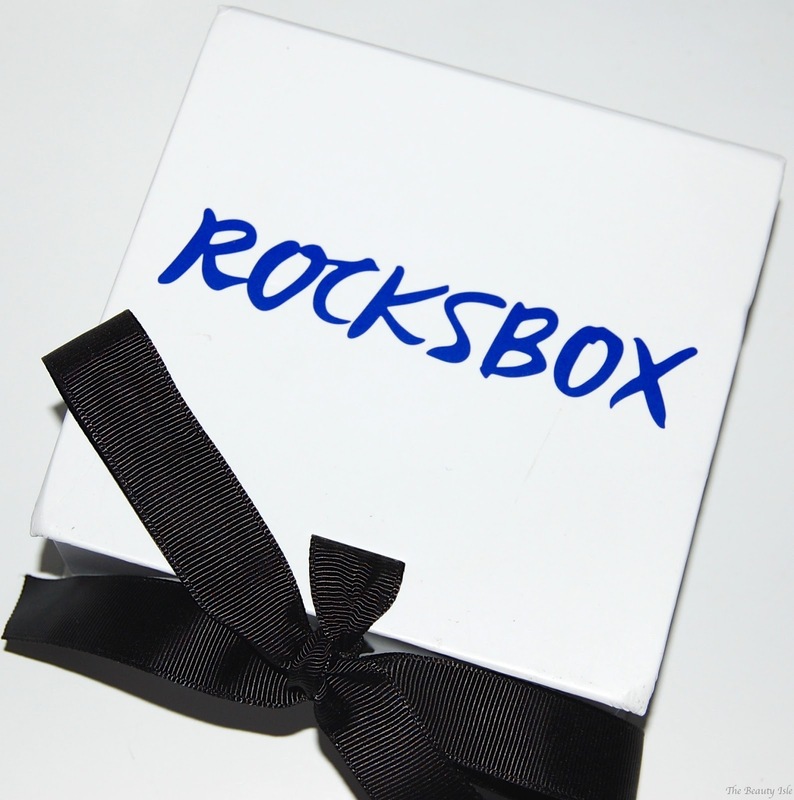 Rocksbox costs $19 per month and shipping is free both ways. 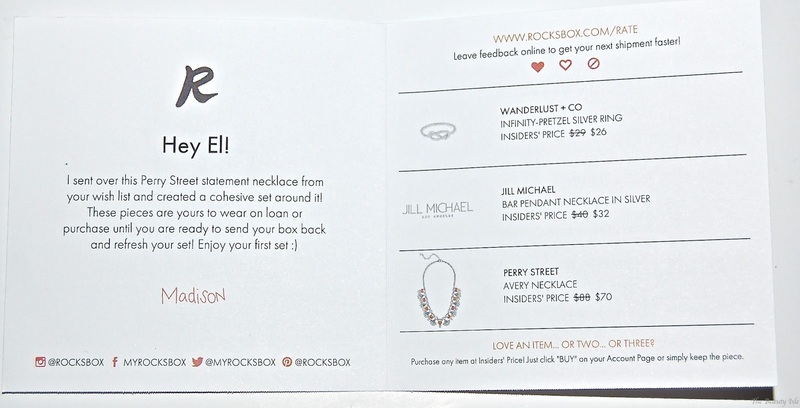 When you first sign up for Rocksbox you take a style survey in order for your stylist to better curate each box to your personal jewelry preferences. For example, if you prefer gold, silver, or a mix of metals. You can add as many items to your "Wishlist" as you like. This helps the stylist curate your box as well. Each Rocksbox contains 3 designer jewelry pieces and they average about $200 a set. Rocksbox sanitizes every item before it's sent out. You can keep the pieces for as long as you like. Any piece you don't send back will automatically be charged to your credit card which is on file. As an "Insider" (subscriber) you are given special pricing (I think it's 20% off) for each item if you want to purchase. Side note: If I'm being honest, 20% is the least they should take off the retail price seeing as how these items aren't brand new. However, the next bullet point makes buying an item more worth it. Each month you get $10 in "Shine Spend". What this means is that if you decide to keep one of the pieces you can get $10 off. This money does not transfer into the next month however. Use the $10 that month or lose it. Once you send back the pieces from 1 box, Rocksbox will send out your next box. Since this is my first box, I'm not sure how quickly that happens but from other reviews I've read, it's fairly quickly. You can return your set anytime, as often as you like. This means that if you don't like anything in your box, send it right back and they'll mail you out 3 new items right away! I received 2 necklaces and a ring in my first Rocksbox. I wasn't very excited about this ring. If I'm going to wear a ring I prefer it to be a cocktail type ring, not delicate like this one. This was definitely a very pretty necklace. 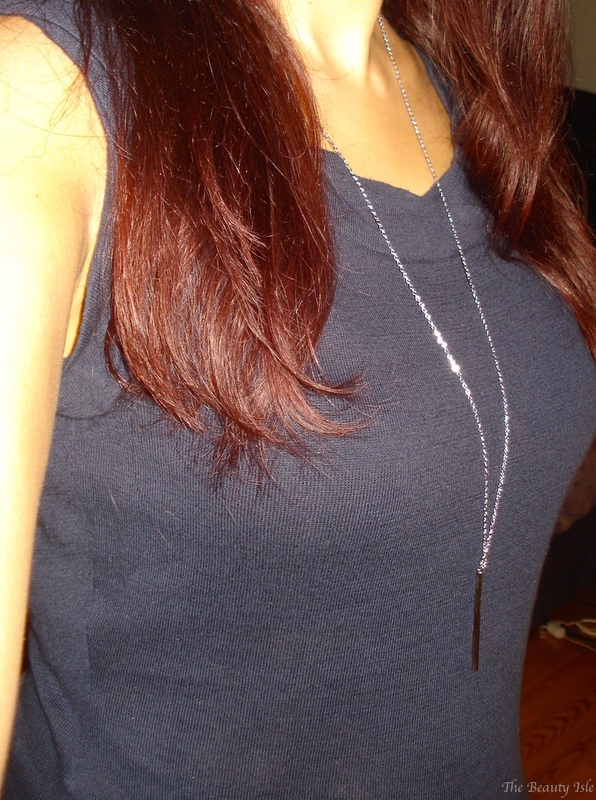 It looks great with a plain top like I wore it with below. I didn't love it enough to keep it though. 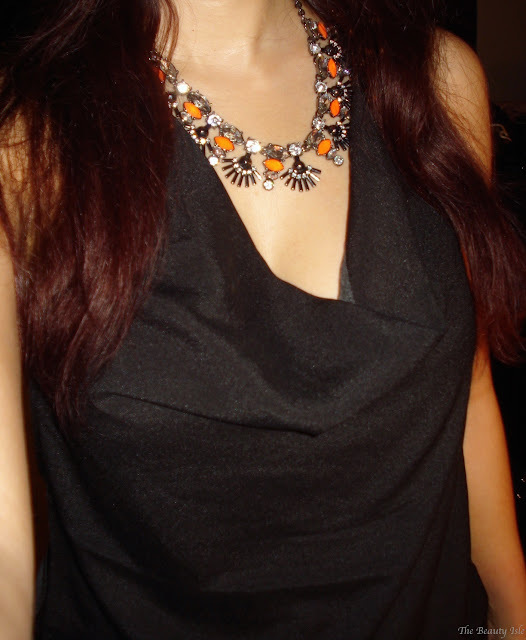 This statement necklace is really unique and sparkly. It's a head turner and looked great with a solid black top. I love that it's orange, such a random color for jewelry! I did really like the necklace, but not for $70. Maybe for $40 or somewhere around there. Overall I really liked my first Rocksbox and I can't wait to see what my stylist sends me in my second box! The best part of this subscription service is getting to try out several new pieces of jewelry with no commitment! Not to mention that if I want to keep a piece I can get it at a discounted price. If you want to try Rocksbox, you can get your first box for free! Just click HERE and enter code thebeautyislexoxo! *I received a trial of Rocksbox for review. All statements are 100% honest and my own.